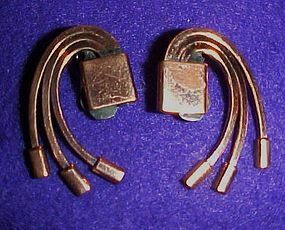 Vintage pair of copper earrings are in nice condition. They are marked Renoir. Clip backs. 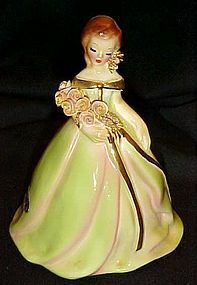 Measures approx 1 3/8 inches by 1 inch. Founded in 1946 by Jerry Fels, Renior of California produced copper jewelry until about 1964. 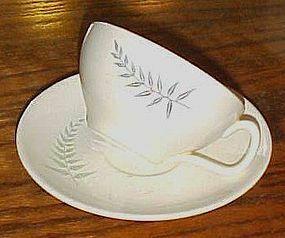 Specializing in geometric abstract forms, Renior has that wonderful mid-century modern styling that is as fresh and appealing today as it was 60 years ago.. Renior pieces are exceptionally well made and will last for Years to come..
Vintage cup and saucer in the Fern Dell pattern by Franciscan. Mid century Fifties style 1957. Oatmeal color background with fern decoration. No chips or cracks. Some use wear on the saucer but still good. I have 5 sets available. Price is for 1 cup with matching saucer. See other pieces to this pattern I have available. Sorry about the camera glare, not so good photo. Victory pattern flatware by Wm. Rogers circa 1927. Dinner fork measures 7 1/2" long and is in good condition with average wear and slight heel wear if any. Tines have a little wear at the ends too. I have 3 available, price is per fork. Silverplate teaspoon by Rogers/International in the PICKWICK Pattern. This flatware pattern dates to 1938 and features a simple rounded handle design. This measures 5 5/8" long and is marked on the back, "Wm Rogers MFG Co. Original Rogers". Great condition with no bends or heel loss. It has the usual faint light scratches from use and storage and a nice shine! 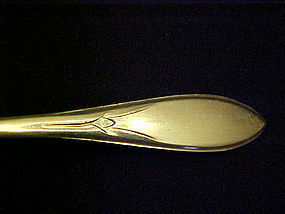 Silverplate Serving Spoon by Rogers/ International in the PICKWICK Pattern. This flatware pattern dates to 1938 and features a simple rounded handle design. This measures 8 1/4" long and is marked on the back, "Wm Rogers MFG Co. Original Rogers". Great condition with no bends or heel loss. It has the usual faint light scratches from use and storage and a good shine! I have 3 abvailable. Preice is per spoon. Pretty floral flatware pattern silver plate soup spoon in the lovely old Arbutus pattern by William Rogers and son circa 1908. Measures 7 1/8" long. Spoon has a lot of wear and scratches on the bowl, so it would be excellent to use in a jewelry craft for a ring, necklace, keychain ect. Vintage hard shell eyeglasses case with goldtone frame, hinged bottom and snap closure. 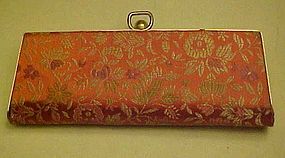 Persimmon and yellow brocade silk on outer case, and lined with silver silk inside. Nice condition with no stains, or pulls. 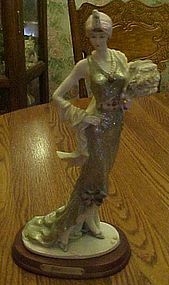 Deco fashion lady figurine from the Jerome Collection. An elegant lady of fashion from the 20's era. Tall sleek and very deco. From her feather tiara and fan to her sleek glittery dress. 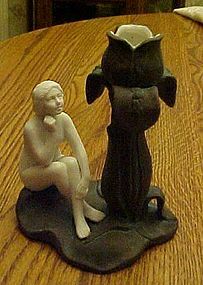 Measures 13 1/4" tall and is on a wood base with brass plaquard that says "Jerome Collection". Not sure of the material she is made of. My friend says porcelain, and I say resin. It really is hard to say. None the less, she is lovely, and there are no damages. 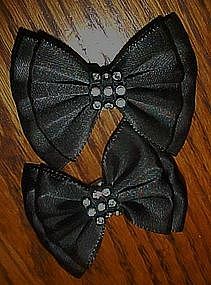 Vintage shoe clips are black satin bows with rhinestone accented centers. 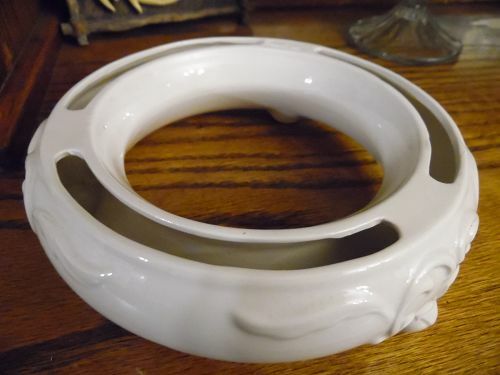 Measures 2 3/4" in diameter. Clip backs, and are in perfect condition. 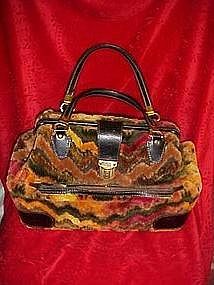 Not sure how old this purse is. It looks older but the condition is extremely nice. Front has a ripple silk fabric, the back is solid smooth silk. 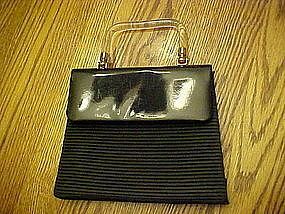 Top has a black patent leather flap with a clear plastic / lucite handle. Tag inside says Starbags MONI. Measures 6 1/2" x 6 plus the handle. Snap closure.Email me if you would like to see a photo of the back. This plate is ancient!! No markings for me to make any idenity. 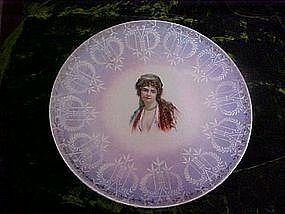 Plate measures 10" in diameter. It has a bust of a Victorian girl in the center. 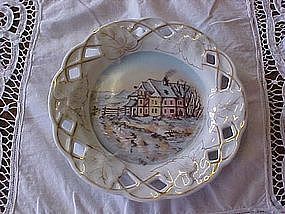 On the border it is a pretty lavender luster with repeating laurel wreath patterns in white. On the extreme edge another small gold patterned border. Gold is faded and worn and there are a few scratches on the ladies face. 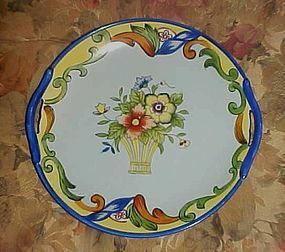 No chips or cracks in the plate. Very pretty! Here we have a ladies mink wrap. 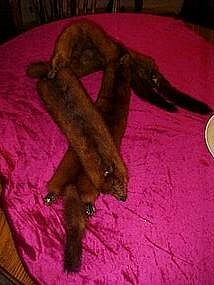 Made out of 4 whole minks, head to tails! Fur clip on one end so you can adjust it to your desired position. Very good condition. Fur is still soft and pliable.Email for more photos.